This 85-acre state park is dominated by Mt. Pisgah, an 885-foot-high ridge that separates Kreutz Creek Valley to the north and East Prospect Valley to the south. The park landscape also consists of mowed grass fields on the northern and eastern park slopes, a pine plantation in the southern area, and mature woods in the western section. Samuel S. Lewis State Park is in southcentral Pennsylvania, York County, about 12 miles east of York, Pennsylvania. From the Wrightsville exit of US 30, follow Cool Creek Road south 1.5 miles to Mt. Pisgah Road and the park. 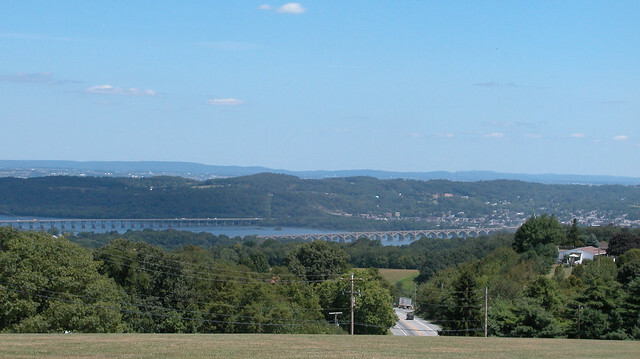 The 885-foot Mount Pisgah is the highest point in the area and offers a spectacular panoramic view of the surrounding Susquehanna River Valley, including surrounding towns and fertile farmlands. Near Hilltop Pavilion, a wayside panel and coin-operated viewing scope allow visitors to view and identify various points of interest along the river valley. On clear nights, local organizations hold star gazing events at the park so the public can enjoy Mount Pisgah’s uninterrupted view of the stars. Check the park’s calendar of events online for program dates and times.